Scramble are a UK based company that produces some of the most exciting and adventurous Brazilian jiu-jitsu gear and clothing out there. Their chic and fashionable fight-wear can be seen adorned on some of the top BJJ trainers from all across the world. Scramble are known for using Japanese designs and imagery to create vibrant and dazzling gi’s, rash-guards and shorts that really stand out amongst the sometimes sterile, bland, over-masculine gear worn by most men. With tons of quality gi’s on the market, it can be difficult to decide just exactly what Scramble gi you should buy. It was far too tough to narrow our choice down to just one single gi as each one offers something different than the other and serves a specific niche or need. So instead, we’ve settled on three categories and chosen the absolute best gi you can buy in each of those categories. You can look at the Standard Issue Semi Custom GI as a blank canvas. Available in white, navy and black, this gi is undecorated except for two minor branded tags. It’s up to you to how much or how little you choose to customise this gi with your own patches. To get you started, it comes with eight woven Scramble patches that you can attach to your gi. They feature the stunning Japanese-style designs that Scramble have become famous for in the colours of black, white and red. These patches can be ironed on but it’s preferable to sew them on to prevent them peeling off after heavy use. But of course, you can sew on any personal patches that you want onto the gi to really make it your own, not just the ones that come in the package. If you prefer a plainer, more minimalist look, then by all means, leave the gi blank. This gi is made with a 450gsm pearl weave top and 230gsm cotton ripstop pants. This keeps the entire gi very tough and durable whilst remaining light and breezy; the entire gi weighs less than 2kg and can be comfortably worn by both male and female trainees. It’s generally a slimmer fit gi with slightly tapered sleeves to make it more difficult for your opponent to manipulate them whilst still leaving you with the ability to perform sleeve chokes of your own whenever possible. Despite it’s budget price, this gi both looks and feels like a high quality premium model. It’d be tough to find a better gi at a better price. If you’re in the market looking for a quality gi to use for competition purposes, then you can’t do much better than the Athlete version 3. It’s available in the competition approved colours of either white or blue; the white has navy blue trimmings and details whilst the blue is paired with a vibrant red trim and detailing. These minor details give the gi a stylish edge without being overly loud or garish. As can be expected with any level of Scramble product, the attention to detail and the expert craftsmanship is exceptional. Every facet of the gi, no matter how seemingly minor, is obviously given the utmost care. It’s somewhat to rare to see a company explode in popularity like Scramble has without eventually sacrificing their craftsmanship as they have to satisfy more and more orders. But Scramble have stuck to the foundation of what has made them popular to begin with: a careful eye for detail. The jacket is a 450gsm pearl wave jacket paired with 12oz cotton twill pants. The 12oz cotton twill just adds that extra toughness that is needed when stepping onto the mats. 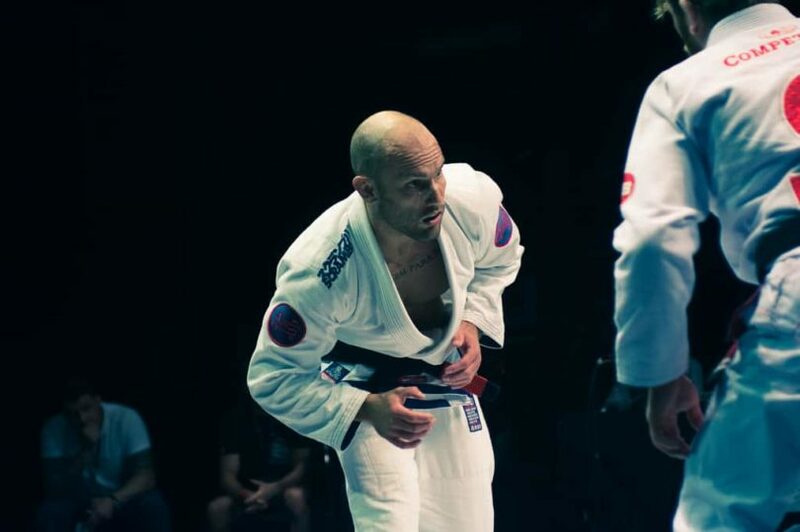 You might train hard in the gym but competition is completely different when it comes to roughness and intensity; you want to make sure you have a gi that can hold up to the rigours. But this added toughness does not make sacrifices when it comes to weight, so the gi remains light enough that you can weigh-in with it without accidentally boosting yourself to the next weight class. Even if you don’t plan on using it for competition purposes, this gi is light, comfortable and durable enough to be used as an everyday gi in classes without any issues. The Scramble Toshi gi is one of the most stunning and stylish gi’s currently on the market. This gi is part of a larger range that Scramble released in summer 2017 called the “Toshi” range. The Toshi range is a range of BJJ related products such as the aforementioned gi, rash guards, spats, etc. that is based on “urban environments and the amazing jiu-jitsu communities embedded within them”, featuring imagery from big cities such as London, Tokyo, New York and the BJJ Mecca of Rio de Janeiro. Several casual t-shirts, a lightweight summer jacket and even a holdall are also available. The limited edition gi comes in a two-tone grey colour with black trimmings and silver custom embroidery. As mentioned, this choice of a grey colour scheme is to further reflect their urban, inner-city influences. This gi is the lightest gi on the list, weighing only 1.6kg. This makes it the perfect summertime gi to use in class when the temperatures begin to rise. Whilst the rest of your training partners are beginning to sweat and tire, you’ll be able to continue to train hard whilst staying clean, dry and fresh. The Toshi features the same 450gsm pearl wave jacket as the other gi’s and retains that same cool, sleek design that Scramble are famous for. Despite it’s low profile and slim-fit cut, the jacket can hold up to heavy use and violent pushing and pulling without faltering. Most people already have closets full of the boring white and blue gi’s. It’s sometimes difficult to differentiate yourself or express yourself clothing-wise when only settling for the standard gi colours. Try something different with the Toshi gi and stand out in a big way at your next class.